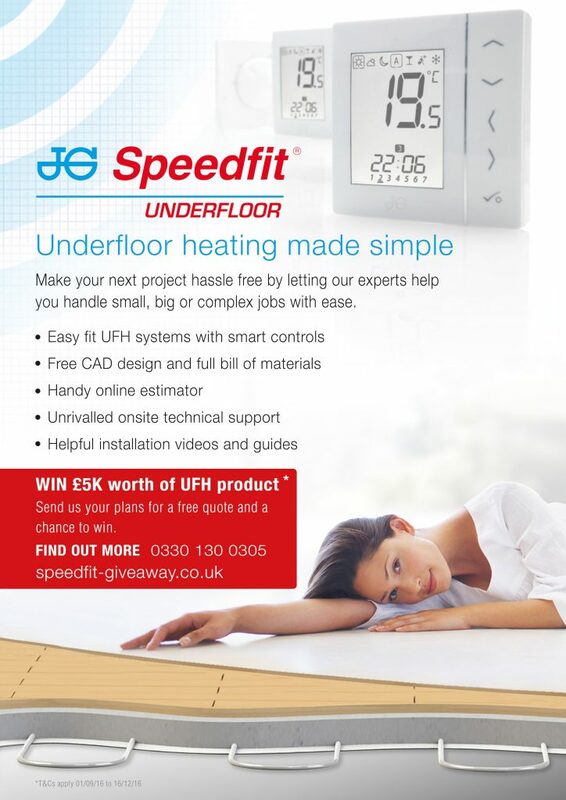 Installers have a chance to win £5,000 worth of underfloor heating products, thanks to JG Speedfit’s latest competition. By sending in design plans to JG Speedfit’s underfloor heating specialists, installers will be entered into a prize draw, while also taking advantage of the company’s free estimation and CAD design support service. The new-look ‘Speedfit Support’ team is on hand to provide installers with support on all of JG Speedfit’s product lines, including it’s UFH systems. From design specification to onsite installation advice, JG Speedfit’s experts are there to make the UFH process as simple as possible. JG Speedfit provides installers with high quality, easy fit UFH systems and then support the installation process with online videos and guides, a dedicated helpline, and onsite technical help, all free of charge. On top of this, by simply sending in upcoming project plans, installers can take advantage of JG Speedfit’s quote and bespoke CAD drawings, one of the quickest services in the market. Calling your local Speedfit sales or technical contact. Alongside the competition, JG Speedfit has updated its UFH literature, providing installers with a single brochure for all of their UFH needs. The brochure will include installation guides for all of the company’s UFH systems, in addition to advice on the best practice in applications. Launching in September, the literature will be available to be downloaded on the JG Speefit UFH website (www.speedfitufh.co.uk) or installers can contact their local product manager. For more details on the prize draw please visit www.speedfit-giveaway.co.uk.